Born on 10 October 1850 in the northern town of Trélon, Léon-François Comerre’s family moved to the larger city of Lille in 1853 when his father, Oscar Louis, obtained work as a schoolteacher there. Somewhat inexplicably, the young Comerre did not start his own official schooling until age seven. However, he made up for lost time with a academic record, winning a gold medal at the Académie de Lille at age seventeen. The gold medal entitled him to a scholarship that allowed him to pursue his art education in Paris. One year later, in 1868, Comerre was working in the studio of the renowned Alexandre Cabanel, who inculcated a taste for both lush nudes and orientalist fantasy imagery in his pupil. That same year, the Minster of Fine Arts honored Comerre as the “most promising student”, a recognition that subsequently gained him admission to the prestigious Ecole des Beaux-Arts. With such an auspicious beginning, Comerre must have been somewhat dismayed to interrupt his art education to fulfill his military service obligation in 1870—especially since France was about to embark on the ill-fated Franco-Prussian War. In spite of these obstacles, however, the determined young artist managed to submit a painting entitled L’Italienne to the Salon of 1871. The following year, he resumed his studies at the Ecole des Beaux-Arts and received an award for his entry in that year’s Prix de Rome competition. In 1874, he was again a second-place finalist, but in 1875, he finally succeeded in winning the coveted Grand Prix de Rome with a religious painting of an angel announcing the birth of Christ to the shepherds (L’Annonce aux bergers la naissance du Christ). This academic accomplishment was further acknowledged when the City of Lille awarded Comerre a gold medal for being the first student from the Ecoles Académiques de Lille to win the Prix de Rome for painting. His professional triumph was further underscored when he won a third class medal for a painting of Cassandra at the 1875 Salon. Having achieved such remarkable success, Comerre began the next stage of his career with a journey through Belgium and Holland before making his way to Rome. This sojourn in the Lowlands was an unusual detour, but it may reflect Comerre’s interest in the strong naturalist tradition of both Flemish and Dutch art. The French Realist painters of the 1850s and 1860s had already inspired a fascination with still life painting, so perhaps it is not surprising that Comerre would want to steep himself in his native northern tradition before delving into the wonders of ancient and Renaissance Italy. Once in Rome, however, he seems to have devoted himself to his studies with the same commitment and determination he had demonstrated in Paris. He arrived at the Villa Medici in January 1876 and remained there for four years, painting several key works including Jezabel Devoured by Dogs and Junon, both from 1878, and The Loving Lion in 1879. Upon his return to Paris in 1880, he found a small studio at 67 de la rue Ampère and began to establish himself as both a history painter and a portraitist. As before, his paintings were frequently recognized with official honors; the second-class medal for Samson and Delilah at the 1881 Salon is one example. Official recognition also brought financial rewards. Comerre’s portrait work was widely sought after by the haute bourgeoisie, those wealthy merchants and their wives who wished to be immortalized in paint rather than in a photograph. In 1882, Comerre also sold one of his most popular paintings, an image of a ballet dancer entitled Une Etoile, to an American collector, thus expanding his audience to include the lucrative US art market. 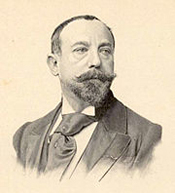 It was perhaps at this period of his life that he also married, either before, or shortly after, his 1884 move to the wealthy Parisian suburb of Vésinete. By all accounts, Comerre settled into a comfortable family life here, raising his son Maxime, and participating actively in the life of the community. In fact, he was a member of the local city council from 1904-1908. What is less clear is when he lived in London. Although all available documentation states that Comerre lived for a time in the British capitol, none indicate exactly when this occurred. However, it is known that he exhibited his work at the Royal Academy, the Royal Society of Portrait Painters, and most intriguingly, at the Royal Glasgow Institute of Fine Arts. Since the Glasgow Institute was not open to foreign artists until 1880, and since Comerre’s whereabouts in France are well documented during that decade as well as in the early twentieth century, it seems likely that his stay in London probably occurred in the 1890s. Comerre also enjoyed the patronage of the French state. He received a number of major mural commissions, both for the city of Paris and for Lyon. In 1886, he was asked to create decorative murals for the Salle des Fetes in the town hall of the fourth arrondissement in Paris; his subject matter was the four seasons. Subsequently, he painted the ceiling and eight panels for the Préfecture du Rhone for the City of Lyon. This type of commission was particularly sought after by all painters in the late nineteenth century, both as a sign of official approval and because the financial rewards were significant. Shortly after these projects were completed, Comerre was received the Legion of Honor award. As the nineteenth century came to a close, the art world was rocked by the avant-garde changes of Les Fauves and eventually, the Cubists. Comerre, however, remained true to his classical academic style, albeit updating it with elements of modern life, as in the 1903 painting of En bicyclette au Vésinet, an image of a contemporary young woman pausing for a moment beside her bicycle, wearing a plain split skirt that not only reveals her lower legs, but is obviously a pair of culottes. It is tempting to wonder whether Comerre shared his thoughts on art with his nephew Albert Gleizes, who would become a leading Cubist painter by 1910. Having begun his career in the heady, if somewhat overblown, atmosphere of the Ecole des Beaux-Arts in the 1860s, he lived to see the art world evolve dramatically into a more openly commercial and aesthetically challenging realm. Comerre seems to have remained actively involved in his work and his community until his death in 1916.